For the first time since moving to NYC, I made dinner for my friends. I went shopping at Trader Joe's, packed everything up and moved to a way bigger kitchen-my friend's in Brooklyn. She has a Cuisinart food processor! My dream food processor-much bigger than mine and it moved so smoothly and quietly. It was just beautiful and I wanted to take it home with me. Making the pesto was such an easy process and I didn't have to worry about it. My food processor is wonderful though; I've put it though the ringer (can you say sticky dates?) and it's still working well. The grass is always greener right? I couldn't fit the Cuisinart in my tiny kitchen anyway lol. I loved cooking in my friend's kitchen; I had alot of space to work so I could make everything with ease. Making food for other people can be stressful because you want everything to be right, even if you're cooking for family and close friends, you just want everyone to love it. I hit a home run last night! 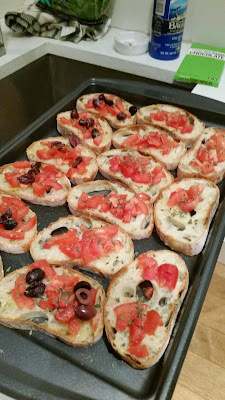 I started out making the bruschetta; I bought a loaf of ciabatta bread, topped it with veggies and olive oil and baked it for a few minutes. 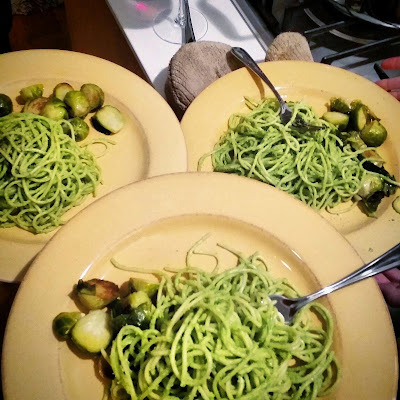 Next I made the pasta and brussel spouts and all the while, my raw brownies were setting in the fridge. Pesto sauce...this sauce is so creamy you won't even think about cheese. It doesn't contain any nutritional yeast and it has so very few ingredients but the secret is soaked cashews...they just make this sauce pop and they keep you coming back for more. Slice the bread into small bite size or nearly bite sized pieces. Brush the bread pieces with olive oil. Slice the tomatoes into tiny pieces and slice the olive in half. If you're using fresh garlic, peel and cut into tiny pieces. Top your bread with the veggies and garlic. Place in the oven at 350 degrees for about 10 minutes or you can skip this step if you feel the bread is crispy enough. Top with fresh basil, if you have it. Serve as the appetizer. Soak 1/2 cup of cashews for about 30 minutes before making this sauce. Make your spaghetti according to the package. If you have gluten-free pasta, it will need to boil longer than regular pasta, so keep this in mind. 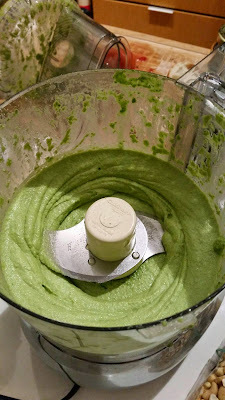 In your food processor, combine 1 cup of spinach, 2 tbsp of olive oil, 2 cloves of garlic, the soaked cashews and sea salt and turn your processor on high. You will need to add the filtered water slowly, don't water it down too much but keep the sauce moving; you don't want it too thick. Once you have it at a consistency where you will be able to stir it easily into the pasta, set it aside until the pasta is done. Strain and transfer the spaghetti into a large bowl or keep it in the pot you cooked it in and stir in the pesto sauce. Make sure all the spaghetti is covered in pesto sauce and serve right away. 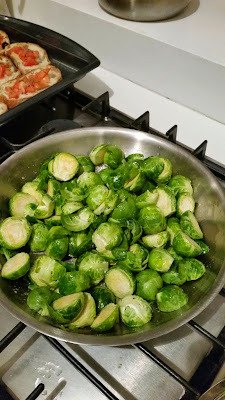 Depending on how many people you are serving and how the brussel sprouts are packaged, use enough brussel sprouts to feed everyone. I served 6 people and I used two large containers of brussel sprouts. 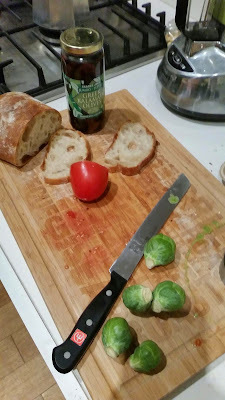 Cut the ends of the brussel spouts off and remove the brown, outer leaves off the sprouts. Wash the sprouts and transfer to a medium skillet with 2 tbsp of olive oil and 2 cloves of garlic. Turn the heat on low. Trim,wash and add all the brussel sprouts to the skillet and keep the heat on low. Put the lid on the skillet and let the brussel sprouts brown. Once they are brown and coated with olive oil (after about 20 minutes), remove from the heat and serve. In your food processor, process the cashews on high. Add the fruit and vanilla extract and keep processing. Add the cacao powder and coconut oil and keep processing. You may have to scrape the sides of your food processor and keep it moving with a fork. The batter will become a sticky, thick chocolatey mix. Line a square glass dish with wax paper, wet your fingertips and press the brownie batter into the pan. I wanted thicker brownies, so I repeated the above steps and made another batch of brownies, pressing the batter into the same pan. Refrigerate for a few hours while dinner is being served. Before serving the brownies, cut them and melt the chocolate with the milk on low low heat (you don't want to burn the chocolate!) Pour the chocolate sauce over the brownie before serving. The brownies, when not covered in chocolate sauce, are raw. 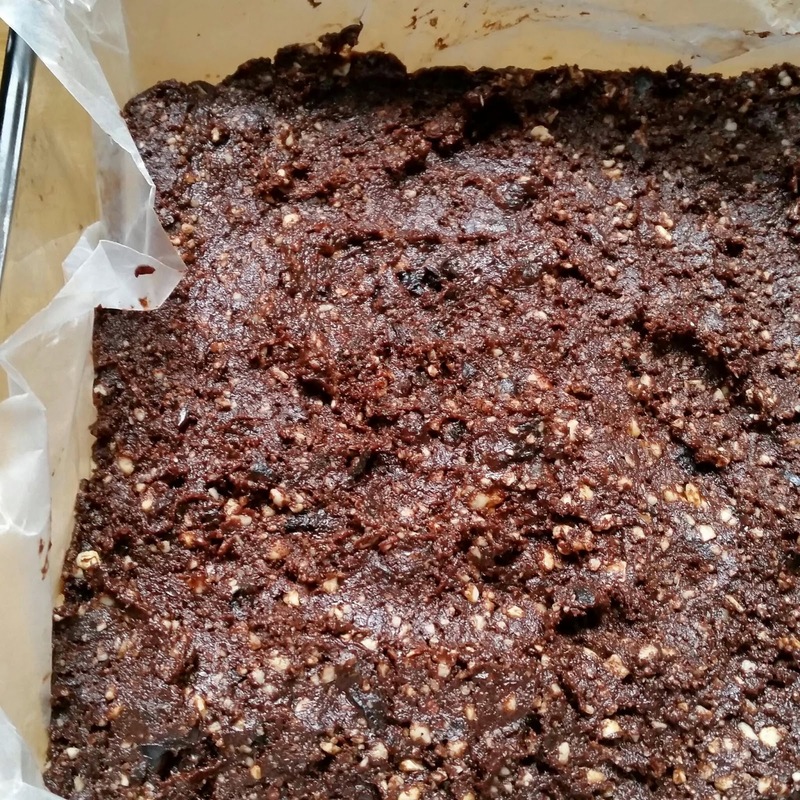 To make lower fat brownies, replace the coconut oil with water, just a little bit of water. Use any nuts you wish and use all dates if you want; I'm just pretty obsessed with pitted prunes. That was what I served and it was a huge hit! My friends were praising me left and right and everyone chilled out after dinner with full tummies while we talked and laughed the night away. This was definitely the best Valentine's day I've had in such a long time. I usually don't embrace the day or appreciate it for what it is: a fun day to celebrate love, any love...self love, friend love, romantic love, family love, whatever love inspires you and makes you happy! But always be sure to practice self love; otherwise how can you love others? !